Very nice- A bit blurrt y to see properly. 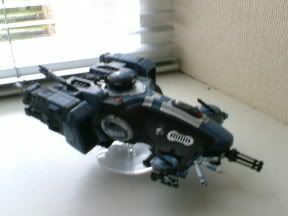 nice scheme, IIRC that was my first Tau scheme. on the use of the camera, holding it still for 5 seconds before taking the photo improves the quality also not pointing it towards any bright lights or reflective surfaces also helps, some of the glare can be reduced by turning off the flash on the camera. Very nice and clean, I really like the scheme. I&#39;m going to have to go with everyone else and say its a bit blurry but its also very nice and lcean and the color is a nice choice and looks great. Good job in my book! And wow your first Devilfish? Great job. dman boy!...if I start a tau army, my color scheme is gona be that!...you think you could make beta fotos so I can kinda copy it? and do you think you can give me the paints used?? ?